Wales defence coach Shaun Edwards says he is disappointed people have suggested he made a rude hand gesture during Wales' 22-9 win over Ireland. 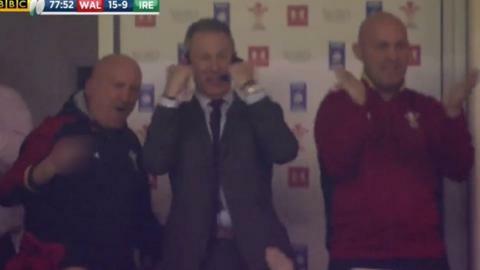 Social media users highlighted the moment Edwards celebrated Jamie Roberts' match-clinching try. But the ex-rugby league international was incredulous it was that and not Wales' "incredible" defensive display which made headlines. "I was disappointed at that. It was just a harmless hand gesture," he said. "I was just throwing a punch in the air and people are talking about that instead of talking about an incredible defensive performance when Ireland were kept try-less for the first time in four years. "That was a little bit disappointing." And a laughing Edwards added: "I'm a child of the 90s and if you're going to say something rude you stick two fingers up, not one." Edwards said Wales' defensive display against Ireland was the best since he has been part of the coaching team - a run going back to 2008 and taking in two Six Nations Grand Slams and a championship win. With Edwards in charge, Wales conceded just two tries during their 2008 Grand Slam, three in 2012 and four - all in the opening game - during their 2013 campaign. Asked how the performance of the defence compared with others during his reign, Edwards replied: "I think it was the best one to be honest because of the standard of the opponent." And Edwards added: "They've (Ireland) been averaging 30 points a game recently and I didn't think it was possible to keep a top-four ranked team to single digit points. "Sometimes I set the boys targets of 19-20 points which I think will get the job done because our attack will cover it, but never in my wildest dreams would I have predicted nine points against Ireland. "But we did it and I think you could see the ferocity of our frontline defence. I think the double hitting by our back-rowers in particular was absolutely outstanding." Edwards singled out wing George North for criticism after Wales' defeat by Scotland, and the Northampton Saints wing responded with an impressive display against Ireland, scoring two tries. "I'm just thankful I didn't listen to all those people who said he should have been dropped," he said. "Great players deserve another chance and George is a great player and he came out and he was really determined, stuck to the defensive systems and his attack - he scored two tries, it was awesome. "I'm really pleased for George because not only is he a fantastic rugby player but he's absolutely a credit to his parents and is one of the nicest people you'd ever wish to meet." The 24-year-old North's two tries against Ireland took his overall try tally for Wales to 30. He also scored two Test tries for the British and Irish Lions during the 2013 tour of Australia.